Folks have been emailing lately asking for updates on when and where Tim will be appearing next so we thought it was time for another update to match the one on the Worlds End website. Tim will be running impromptu workshops throughout the weekend and he will also be sketching and signing copies of his Worlds End - Volume 1 - The Riders on the Storm all-ages "Science Fusion" graphic novel, Worlds End - Colouring and Storybook, Sketchbooks along with other products throughout the two days. The comic book workshops are interactive and will give everyone a chance to learn, "How to draw characters and layout comic book pages." Tim will be sketching and signing copies of his Worlds End - Volume 1 - The Riders on the Storm all-ages "Science Fusion" graphic novel, Worlds End - Colouring and Storybook, Sketchbooks along with other products throughout the weekend. The Wizards Keep stand will be in the Allied London hall, which is situated just across from the other two main festival halls on Armouries Drive - Leeds. 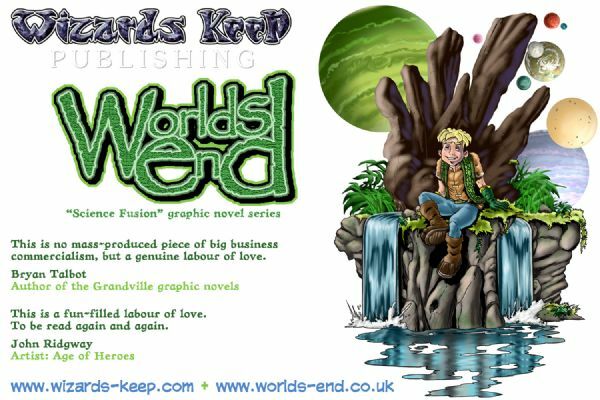 Tim will be sketching and signing copies of his Worlds End - Volume 1 - The Riders on the Storm all-ages "Science Fusion" graphic novel, Worlds End - Colouring and Storybook, Sketchbooks along with other products throughout the weekend. He will also be running his comic art workshops and giving his talk: Worlds End - Creating a New Mythology. Times to be announced. Check back soon for more updates on times, itinerary and last minute surprises.